Péektoys is a Mexican designer brand inspired by our cultural wealth, by the myths and wisdom of each culture -qualities that make our project different and fun. Péek comes from the Mayan word movement. Our purpose is to provide more than just a product; we want to offer an experience with its very own creative methods, with the ability to reveal our identities, letting our inner artists come to light. Mexaheads is our first line of designer toys. 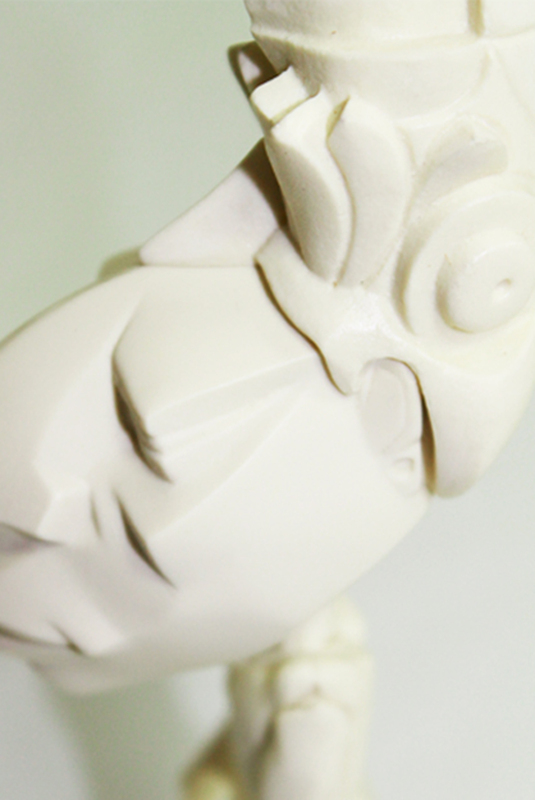 Sáas Kíin, our first character, is inspired by the Mayan culture. His name means brightness and clarity. His story is an appealing combination of both fiction and reality; you will soon find yourself immersed in his plot, getting to know his accessories and powers -which you can collect. His first power is the corn crest, known as penacho, which seeks a connection with the ground. The second power, wind, provides the ability to shape things. The first edition was launched on December 2012, limited to 260 units and manufactured from a cream-colored resin material; we only have ten units left. Last year we launched a new white resin edition with a new feature: enabled movement (both legs can move). The identity of each character is very important, and that is why each one of them has its own features that represent different elements of each culture. New and future collections will be equally inspired by different pre-colonial cultures. All the figures are plain white so that they can be modified and customized. We work hand-to-hand with different craftsmen and artisans communities in Mexico in order to develop our special editions. In 2012, artisan Miriam Cahuich crafted on wood a penacho inspired by corn. This representation was wonderful. This first collection was presented at the Didrichsen Art Museum in Finland. After this great success, and after observing people´s interest, we developed a new edition with the 20 de Noviembre community in Calakmul, Campeche, which consists of only seven 9” units, carved entirely from the local region’s wood. Part of the profits from these collections is going to be donated in kind to this community, granting materials and tools in order to foster labor and workforce. We hope you like our brand and make yours our characters, we are working on more collectables and products, Soon new stories.